Bibingka is a type of baked rice cake from the Philippines. It is usually eaten for breakfast, especially during the Christmas season. It is traditionally cooked in clay pots lined with leaves. It is a subtype of kakanin (rice cakes) in Philippine cuisine. Bibingka is also found in Christian communities in eastern Indonesia. The original method of preparing the glutinous rice used in bibingka is known as galapong (commonly incorrectly translated as "rice flour"). It is an ancient tradition unique to the Philippines and related Austronesian regions,. It is essential for most Philippine rice desserts. Unlike other Asian cuisines, the rice isn't prepared dry. Rather it is soaked overnight in tapayan jars and are usually allowed to ferment by the addition of wild yeast called bubod or with tuba palm wine. The rice is then ground into a thick paste using stone mills before being cooked. This gives a characteristically slightly sour aftertaste in Filipino traditional rice cakes. The same process (tapay) when extended for longer periods result in traditional rice vinegars and rice wines. Bibingka is a general term for baked galapong-based cakes, similar to how puto is the general term for steamed galapong-based. In recent times, it has extended its meaning to other native cakes made with other types of flour like corn flour, cassava flour, or plain flour, though these are usually considered separate dishes altogether. The shared origins of bibingka from the Philippines and Indonesia is widely acknowledged. Especially given that the Indonesian bibingka is from Eastern Indonesia, the regions closest to the Philippines with the most closely related cultures. Some authors have also proposed a connection between the Goan dessert bebinca (or bibik) and the Southeast Asian bibingka due to the similarity in names. They believe that the Portuguese may have introduced it to Southeast Asia from Goa. But this is unlikely, given that the Philippines, where bibingka is most widely known, was never a colony of Portugal. They are also very different; the Goan dessert is a type of layered coconut pudding (similar to Filipino sapin-sapin and Indonesian kue lapis), while bibingka is a simple baked glutinous rice cake. The only similarity is that bebinca and bibingka both use coconut milk. Rice-based dishes are also far more diverse in Southeast Asia, where rice is an ancient Austronesian staple crop. Thus it is more likely that the Portuguese introduced the term to Goa from the Philippines, rather than the other way around. Similar to how the art of windowpane oyster shell windows were also introduced from the Philippines to Goa (they are still called capiz in Goa after the Philippine province of Capiz). Bibingka is a traditional Philippine Christmas food. It is usually eaten along with puto bumbóng right after the Simbang Gabi ('Night mass', the Filipino version of Misa de Gallo). They are sold outside of churches during the nine-day novena for worshippers to eat for breakfast. As of October 9, 2007, the town of Dingras, Ilocos Norte in the Philippines is expecting a Guinness World Records certification after baking a kilometer-long cassava bibingka made from 1,000 kilos of cassava and eaten by 1,000 residents. Also, in the municipality of Baliuag, Bulacan, bibingka is served along with salabat (ginger tisane) and the stores selling them serve them for free. Bibingka is traditionally made with galapóng (slightly fermented soaked glutinous rice ground into a paste) and coconut milk or water. Modern versions sometimes use regular rice flour or Japanese mochiko flour. Other ingredients can vary greatly, but the most common secondary ingredients are eggs and milk. The traditional preparation is very time-consuming. A specially made terra cotta container is lined with a single large section of a banana leaf. It is placed over preheated coals and the rice flour and water mixture is poured into it, taking care not to spill it into the container itself. Another piece of banana leaf is added to the top and covered with more preheated coals. Bibingka is also used as a general term for desserts made with flour and baked in the same manner. The term can be loosely translated to "[rice] cake". It originally referred primarily to bibingka galapong, the most common type of bibingka made with rice flour. Other native Philippine cakes have also sometimes been called bibingka. These may use other kinds of flour, such as corn flour, cassava flour, or plain flour, and are usually considered separate dishes altogether. Bibingka can also be made with uncommon ingredients, including chocolate. Bibingka galapóng is the traditional form of bibingka made from ground soaked glutinous rice (galapóng), water, and coconut milk. It was originally only made with water and galapóng. Bibingkang malagkít is a moist version of bibingka, typically served sliced into square blocks. Bibingkang Mandaue (Mandaue-style Bibingka) are bibingka from Mandaue, Cebu. It is traditionally made with tubâ (palm wine) which gives it a slightly tart aftertaste. Nowadays, tubâ is often substituted with yeast. Cassava cake is made from grated cassava, coconut milk, and condensed milk. It is the most similar to pudding in appearance. Also known as cassava bibingka or bibingkang kamoteng kahoy. Salukara, a pancake-like variant of bibingka from Eastern Samar. It also uses tubâ and is traditionally cooked in pans greased with pork lard. Sinukat a type of bibingka baked in half of a coconut shell. Bibingka or bingka is also popular in Indonesia, particularly among Christian-majority areas in northern Sulawesi and the Maluku Islands, both of which were former colonies of the Portuguese Empire and are geographically close to the southern Philippines. It is prepared almost identically to Philippine bibingka. In the provinces of North Sulawesi and Gorontalo, bibingka is usually made with rice or cassava flour and coconut milk with shredded coconut baked inside. In the Maluku Islands, bibingka is spiced and sweetened with brown sugar or sweet meat floss. 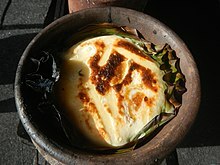 It is also traditionally cooked in clay pots lined with banana, pandan, or nipa leaves. As in the Philippines, it is also usually eaten during the Christmas season. A pancake-like variant of bibingka was introduced to the Chinese Indonesian communities of East Java during the Dutch colonial period. Known as wingko, wiwingka, or bibika, it became popular throughout the island of Java. ^ Gene Gonzalez (2017). The Little Kakanin Book. Anvil Publishing, Incorporated. ISBN 9789712731921. ^ Lilles, Cecile Lopez (7 September 2006). "Reclaiming the vanishing tradition of Filipino 'merienda'". PhilStar Global. Retrieved 8 December 2018. ^ "Sweet and Sticky Pinoy Treats: Our Top 10 Kakanin". www.spot.ph. 22 June 2010. Archived from the original on October 8, 2011. Retrieved January 6, 2011. ^ a b Jerry Pinto (2006). Reflected in Water: Writings on Goa. Penguin Books India. pp. 253–254. ISBN 9780143100812. ^ a b Alan Davidson (2014). The Oxford Companion to Food. OUP Oxford. p. 684. ISBN 9780191040726. ^ Sonak, Sangeeta M. (2017). Marine Shells of Goa: A Guide to Identification. Springer. p. 194–197. ISBN 9783319550992. ^ Alvin Elchico, Gracie Rutao and JV Dizon (2010-12-24). "Filipinos go for ham, bibingka for Christmas". ABS-CBN News. Retrieved January 6, 2011. ^ Jun Belen (20 December 2010). "Feeling Sentimental and How to Make Bibingka (Christmas Rice Cakes)". Retrieved January 6, 2011. ^ a b "Bibingkang Galapong and Bibingkang Malagkit – Triumph & Disaster". Market Manila. 25 August 2006. Retrieved January 6, 2011. ^ "Bibingkang Mandaue". Market Manila. 17 October 2006. Retrieved January 6, 2011. ^ "Linamnam at Latik: Ang pagkain ng Samar". GMA News Online. 16 November 2012. Retrieved 17 October 2018. Wikimedia Commons has media related to Bibingka.